Yep, as we should have anticipated. For those of you not familiar with B2Osh (okay that’s probably all of you) its an annual fly-in where typically 100+ Beechcraft Bonanzas as well as a few Barons fly formation from Rockford, IL to the EAA Airventure show in Oshkosh, WI. This formation is a series of 3-ship ‘elements’ who all line-up on the runway and takeoff with 15-second spacing. 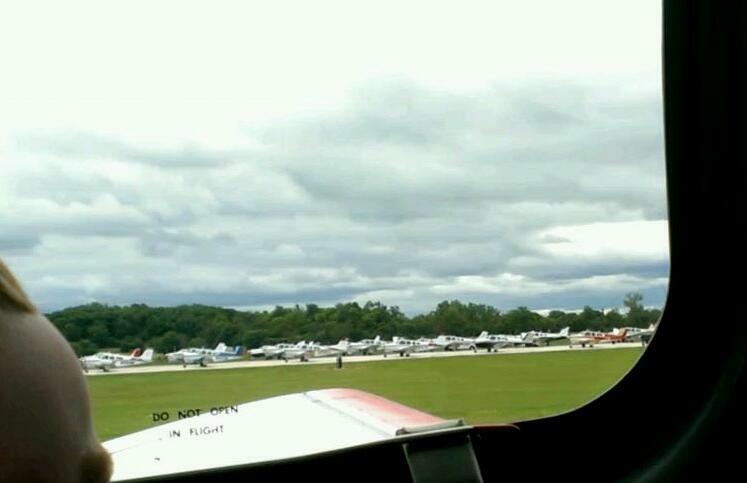 The mass arrival at Oshkosh is pretty spectacular. Then we taxi to the campground and set-up tents between the airplanes. My dad and I have done this together for about 5-years so it seemed natural it should be Mr. C’s first (non-airline) flight. He was so excited about all the airplanes coupled with travel exhaustion from the day prior that he passed out around the time element 22 took off. Try as we may we couldn’t shake him to be awake for the takeoff (we were element 33…almost last before the barons). Oh well, many years to follow, and at least it meant no puke! « Ugh!! I’m getting old! !